Elasticsearch 5.x provides major new features and improved usability, but there are a few things you need to keep in mind when upgrading to our latest and greatest software in Elasticsearch Service. A number of Elasticsearch queries were deprecated in version 2.0 or later and removed in version 5.x. Applications running deprecated queries might break after upgrading to 5.x. Starting in Elasticsearch 2.3, a deprecation log became available that can help you determine if your applications are affected. Before you upgrade, check this deprecation log. If you are using deprecated queries, you will need to update your applications. In Elasticsearch 5.0 and later, the security features required to keep your Elasticsearch Service clusters safe became part of X-Pack. With the move to X-Pack, the biggest changes to security features for the Elastic Stack include the names of the security configuration options, TLS/SSL configuration, and how roles are defined. A few privileges have also been removed. When you upgrade an Elasticsearch cluster on Elasticsearch Service to version 5.x, the upgrade process to the new X-Pack security features is handled for you. 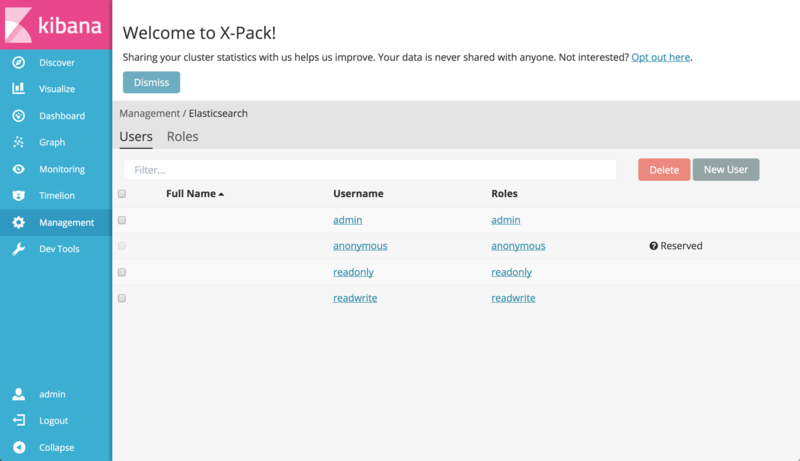 As part of the upgrade process, all users, roles, and user-role mappings that exist in your Shield configuration are upgraded to use the new X-Pack security features. In addition, two users are always created on version 5.x clusters, the elastic superuser and the anonymous user. If your cluster never had an active Shield configuration, or if you are not provided the password during the upgrade process, you might need to reset the password for the elastic user after upgrading to Elasticsearch 5.x. Users and applications will need to authenticate to be able to connect to your cluster. To learn more about working with X-Pack security features in Elasticsearch Service, see Securing your Cluster. For more background information about X-Pack for the Elastic Stack, see Securing the Elastic Stack. Indices created in Elasticsearch before version 2.0 are not compatible with version 5.x, even if you upgraded your cluster to version 2.0 or later at some point. To upgrade to Elasticsearch 5.x with these indices, you must perform some additional steps. If you upgrade to Elasticsearch 5.x with indices that are not supported, your Elasticsearch cluster will not start. Please make sure you follow the steps in this section first. Check if you can upgrade to Elasticsearch 5.x directly. For all versions of Elasticsearch: You can find out what version of Elasticsearch an index was created with by querying the index settings and looking at the value of settings.index.version.created. The first number in the value indicates the major version of Elasticsearch and any value that is below 2000000 is not readable in Elasticsearch 5.x, even if settings.index.version.upgraded shows a value that is greater than or equal to 2000000. If created indicates a value that is greater than or equal to 2000000, you can upgrade to Elastisearch 5.x directly. In this example, the index was created with version 2.3.0 (created: "2030099"). You can skip the rest of the steps in this section and proceed to upgrade your cluster. If created indicates a value that is smaller than 2000000, you cannot upgrade to Elastisearch 5.x directly. Before you upgrade to Elasticsearch 5.x, follow the remaining steps in this section first. Indicates an index created with Elasticsearch 1.7.1. Indicates an index created with Elasticsearch 1.6.2. For Elasticsearch 2.0 and later: You can see a human-friendly value for the version that an index was created with by appending ?human=true to your query URL. Use the migration plugin that is available for Elasticsearch 2.3.0 and later by upgrading to 2.3 first. This means that you migrate in a two-step process, first by upgrading from 1.x to 2.3 and then by upgrading from 2.3 to 5.x with the migration plugin. This process performs an online reindex. Use the upgrade functionality in Elasticsearch Service built around the Upgrade API. This option performs a remote reindex of your indices and checks if the upgraded cluster will be able to start after upgrading. There is additional overhead when you use this option. If your cluster is already running at capacity before the upgrade, Elastic recommends that you temporarily step up to the next available cluster size before upgrading, so that the reindex operation can complete in a reasonable amount of time. You can step down to the original cluster size after upgrading to avoid further costs. If neither of those options work for you, you can also upgrade your indices on a cluster running Elasticsearch 2.3.x yourself with the Reindex API. For more information, see Reindex to upgrade. Snapshots cannot be restored in Elasticsearch 5.x, if they contain indices created in an Elasticsearch version before 2.0. To work around this restriction, you either need to discard these snapshots or you need to open them on a cluster running Elasticsearch 2.3 before reindexing and creating new snapshots.